Large black circular knit microfiber cloth. 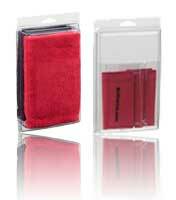 Our ultra-plush deep pile microfiber polishing cloth is 80% polyester and 20% polyamide. This is an optical quality polishing cloth suitable for your highest quality products. Made from split fiber and woven for an ultra deep pile it holds 11 times its weight in fluid, helping you work faster and get more work done. The edges are bound to prevent fraying. Use this cloth on large surfaces, big screen televisions, LCD screens, computer monitors, acrylic furniture and fine art framing.